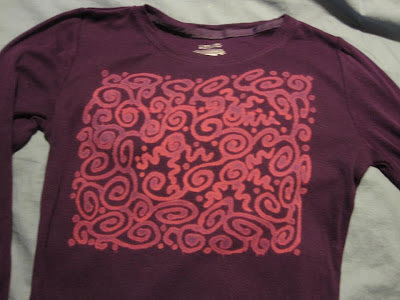 When the bleach pens came out a few years ago I started some experimentation with their magical powers on cotton-knit clothing items that belonged to my kids. Over time, I've messed up quite a few projects thinking that the pens would be as easy to use as my extensive collection of 80s puff paints. Tonight I had a rare splash of time to myself and whipped out a shiny new Clorox bleach pen and a cheap t-shirt I bought at Target the other day. I've refined the procedure and was pleased with tonight's results. Now that Pinterest has exploded you see more and more projects like this. Most of them tell you to wash and dry the shirt first. Do they know who they're talking to? That's the same sort of madness I hear from my husband when he tells me to tape off the windows prior to painting trim. Not gonna happen. It takes some practice to get a steady hand because the bleachy goop comes out in bubbles sometimes. I generally have a straight pin on hand and clear those up as soon as they appear. Directions you'll see will also instruct you to trace your design with chalk first. While I see how that could be a good idea - also, not my style. The one thing you WILL for sure want to do is put something sturdy AND flat inside the shirt while bleaching (I used a large manilla envelope because it's what I had on hand) You may think your design will soak all the way through and make the back of the shirt equally as cool. It won't, so don't. Lastly, different color shirts take longer to process. Keep an eye on it. If you wait too long, the bleach bleeds too far and the overall design is compromised by a huge bleach halo. This shirt processed for about 40 minutes. Once I felt the design was bleached out enough I took the shirt to my kitchen sink and used the sprayer to remove all the bleach gel. I did this quickly so there was no residual bleaching from the run off. After rinsing repeadetly, I wrung out the shirt and popped it right into the dryer. From start to finish I had a hand drawn bleach art shirt in about an hour+.